Search.mysearch24.com is a suspicious website, advertised by a browser hijacker. This is the page that will be set as your homepage and new tabs without permission if you have a particular hijacker installed on your computer. The hijacker causing all this is not malicious itself but it may be able to expose you to unreliable content, which could lead to a malware infection. And even if it was not malicious, you should not allow anything you did not install willingly to remain on your computer. And in any case, hijackers do not do anything useful. They aim to redirect you to sponsored content and to generate traffic for certain sites. Since you get nothing from it, we suggest you delete Search.mysearch24.com. And from now on, pay closer attention to how you install freeware because you allowed the hijacker to enter yourself. Browser hijackers do not ask for permission to enter computers. They get it without you even realizing it. A hijacker, as well as other kinds of unwanted programs are attached to freeware as extra offers and to prevent their installations, simply choose Advanced or Custom settings during setup and uncheck the boxes that appear there. This will block them. Only then should you continue the freeware installation. Avoid using Default because no extra offers will be shown there. As soon as the hijacker installs onto your system, it will make changes to your browser and set its domain as your homepage and new tabs. This will affect all of the leading browsers, including Internet Explorer, Google Chrome and Mozilla Firefox. Without your authorization we might add. Those changes are also irreversible until you uninstall Search.mysearch24.com so keep that in mind if you try to change settings. The new homepage will have plenty of links to various sites, such as Facebook, YouTube, Yahoo, Amazon, etc., all of which are accessible easily by tapping in the address in your browser URL bar. You will also be encouraged to use the provided search engine. If you do, you will be led to nova.rambler.ru where you might encounter sponsored content. Those advertisement results might look completely legitimate which is why we suggest you refrain from clicking on anything. Some could even lead you to malicious websites where you might encounter malware. So if you want to avoid malware, ensure you delete Search.mysearch24.com. 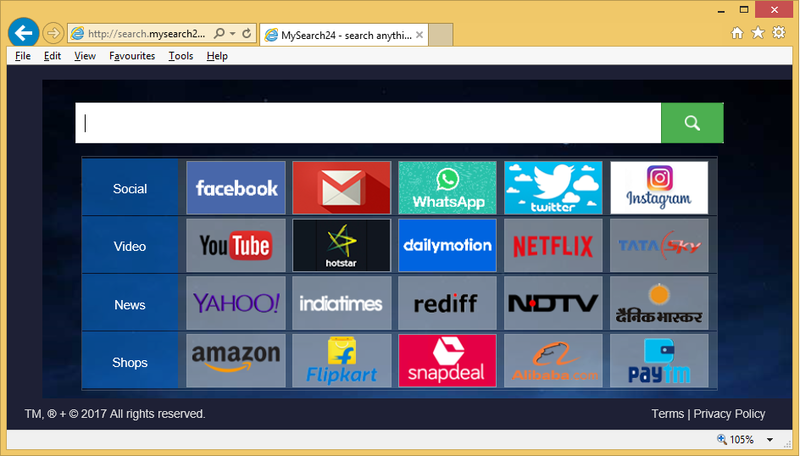 As is usual with browser hijackers, there are two ways to remove Search.mysearch24.com. You can perform manual Search.mysearch24.com removal but you will have to find the hijacker yourself and that could take a long time because you will have to find the hijacker yourself. You can also use anti-spyware software and have it uninstall Search.mysearch24.com for you.